This year’s Larry March Slalom will take place on September 7, 8 and 9. Friday, September 7, will be course set up day, Saturday, September 8, is registration and race clinic day, and Sunday, September 9, will be race day. 8:00 AM -12 noon course setup and registration. 2 pm until 4 pm – course open for practice runs. Google Map Directions Note: You will be parking in the Allentown Police Academy Parking Lot. The 15th Street bridge is repaired and your GPS will route you to the parking lot. Written Directions for those without GPS. Hotel and Campgrounds: There are a number of hotels and campgrounds in and around the Lehigh Valley. You can Google campgrounds Allentown PA, or hotels Allentown PA and find what you are looking for. Here are some suggestions KOA Allentown, Days Inn Allentown. 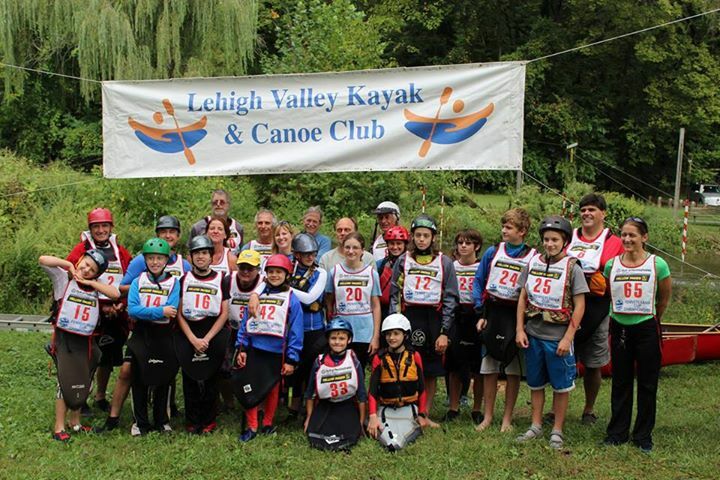 The Lehigh Valley Kayak & Canoe Club was formally organized in 1977. Now in 2017, we are holding the 41th Little Lehigh Penn Cup Slalom Race. The club offers something for everyone interested in paddling. On water and off, activities range from pool classes, informal instruction, flat water and white water trips and races, to film festivals, banquets, picnics, parties, river conservation projects, and even an occasional bike or ski trip. The Penn Cup is a series of beginner/novice races held each year art different locations throughout the state. Each race is organized by a different paddling club. They are designed to provide user-friendly competition and expert advice for paddlers new to the sport, regardless of age. There are many race classes within the Little Lehigh Slalom. These reflect the type of craft, the number of competitors per boat, and the ages and sexes of the participants. Many race for fun and the improvement of their paddling skills in ways that make running rivers more fun. Rick and Casey went on to compete with the US Olympic Team in Beijing, China in 2008. Rick Powell update: Rick Powell competed with US Olympic Team in 2012 in London. 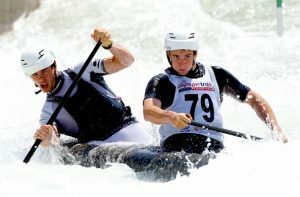 Whitewater Slalom is a test of a paddler’s ability to combine power, speed, and precision in order to negotiate a series of 20 to 25 gates as quickly as possible. It requires pinpoint boat control, strength, stamina and concentration; it is the ultimate test of a whitewater paddler’s abilities. Paddlers must also learn to read the water in order to use it to their best advantage. Those who can figure out how to use the river’s power to position their boat will conserve energy and usually get does the course faster. This is why you will see competitors taking different approaches to the gates, sometimes even running them backwards! Equipment: Paddlers use either canoes or kayaks. Canoes may be either decked or open, while kayaks are generally decked boats. You might find it difficult to distinguish a decked C1 from a decked K1. K1 paddlers use a double bladed paddle and C1 paddlers use a single bladed paddle. K1 paddlers sit in their boats, while C1 paddlers kneel. Classes: Each class has an abbreviation based on open or decked, canoe or kayak, number of paddlers, and gender of paddlers. For example, K1W is women’s single kayak and OC2M is mixed tandem open canoe. At Penn Cup races, these classes are further subdivided for Cadets (under 14), Juniors (14 to 18), and Masters (over 40). Course: A slalom course consists of 20 to 25 gates hung over a river. The competitor must negotiate each gate in numerical order as fast as possible. Each gate consists of two striped poles suspended over the water. The poles are 3 feet apart and are either green and white (downstream gate) or red and white (upstream gate). Each gate also has a number board, which shows its place in the sequence. Object: The task of paddlers is to run each gate in sequence, in the correct direction, and without touching them. Penalties are added to the elapsed time for any infraction. A complete slalom run without penalties is called a “clean run” and is the goal of each racer. struggle to push their boats upstream to successfully run a difficult gate. 2014 Penn Cup Scores here. 2015 Penn Cup Scores here. 2016 Penn Cup Scores here.